This is the time of year where all good intentions go by the wayside at sunset. Running a cafe like the Sleeping Latte takes willpower. At least at the beginning. But after a while baked goods don't hold the same appeal at work. Besides, I'm usually so busy I barely have time to grab a bite during the day. When I do, I go for healthy proteins. A bowl of soup. A small salad. A smoothie of some sort. Staying healthy in the face of all those baked goodies makes me feel virtuous. Healthy eating throughout the whole day continues through dinner. My mother usually packs me up a "it's going to have to be tossed, you may as well eat it" bag at the end of a shift. When night falls so does my guard. I'm tired, it's cold, and Jeff has been working a lot. I'll eat the sandwich, heat up the soup. The I'll look at the dozen kitchen sink cookies she packed up for me, and resolutely promise myself that I will bring six of them to the Cog &Sprocket and six to the police station in the morning. But the kitchen sink cookies taunt me. Mum makes them fresh every day, and always mixes them up a bit. They are my vice. You can't really blame me. February in the Berkshires--it is darker than the inside of a cow outside, and freezing cold. Usually a coat of ice everywhere as soon as the sun goes down. No sense in going outside to ice skate with my car. Tired as I am, the evenings are long. A cup of tea, and a cookie are just the ticket to help pass the time. Just one. Crispy, chewy, full of who knows what mixed in. One won't hurt. They've got oatmeal--that's a little healthy, don't you think? Okay, two. Raisins too. A healthy fruit. Before you know it, I'm nibbling on a third. The chocolate chips sooth the soul. Next thing I know the Cog & Sprocket bag is empty. If I show some resolve, the police station may get their cookies. At least a couple. Kitchen sink cookies, especially my mother's, are my downfall. What's the secret? Make a basic cookie dough, and then add cornflakes (or raisin bran, or frosted flakes, or wheat flakes), walnuts (or pecans, hazelnuts, peanuts, cashews), raisins (or craisins, or dried cherries, or any other dried fruit), and chocolate chips (or white chips, or peanut butter, or dark chocolate, or milk chocolate). You get the idea. Careful of the flavors you mix together. That said, I've never tasted a bad kitchen sink cookie. Here's a good recipe if you want to take them for a test drive yourself. Friends, any of you have winter night time carb loading issues? What is your favorite vice? Julianne Holmes writes the Clock Shop Mysteries for Berkley Prime Crime. 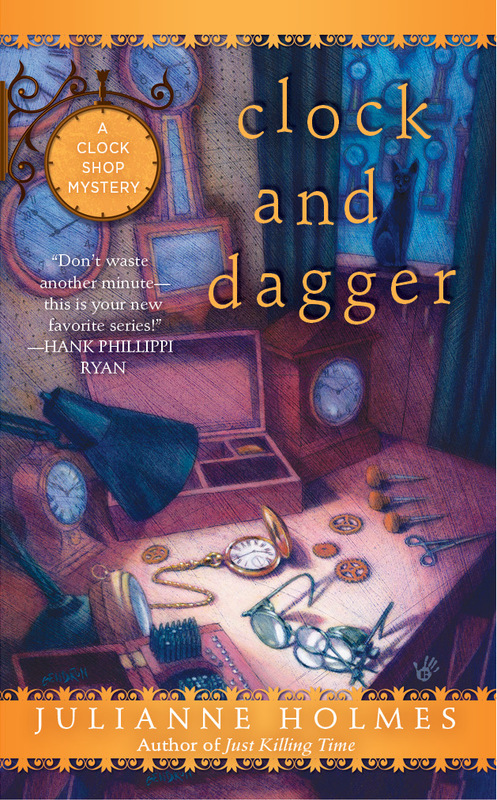 Clock and Dagger, the second in the series, came out last August. Chime and Punishment will be out this August. I don't have a carb issue, I have a problem wanting to drink something warm at night in the winter. It's not the caffeine, it's the liquid before bed that creates havoc on my full nights sleep. I hear you on that. The caffeine also does me it--forgetting and drinking tea at 4 is a disaster! My wife and I are both stress noshers. So of course it's always something in the carb category. I've tried to mitigate it a bit by buying those multi-grain flat squares that look like coasters. LOL At 1 point each I can down at least 10 of them. I have been trying to NOT eat before bed. But, if I absolutely cannot avoid it, there is oatmeal with either cranberries or raisins. So much better than the 1905 vanilla ice cream. That is an awesome cookie recipe -- thanks for sharing it with us. I try not to eat after 7:00 p.m. -- what caused my downfall were my 9-10 p.m. snacks. Also, once I was on Ambien, and I would wake up in the middle of the night in the kitchen shoveling Peter Pan cream peanut butter by the spoonful into my mouth!